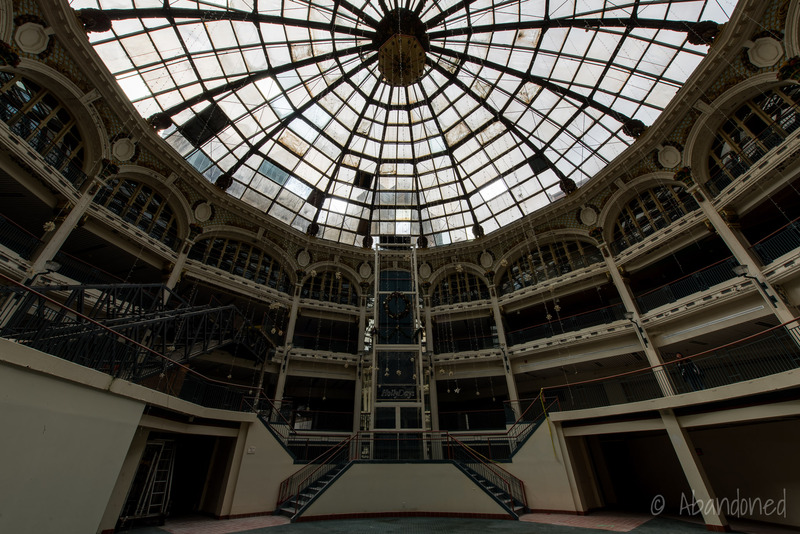 The Arcade was conceived by Eugene J. Barnet of the Barney & Smith Car Company and Michael J. Gibbons as an integrated shopping centre in the heart of downtown Dayton. 30 The five inner-connected buildings were designed by Frank M. Andrews and M.J. Gibbons in the Flemish and Italian Renaissance Revival architectural styles. 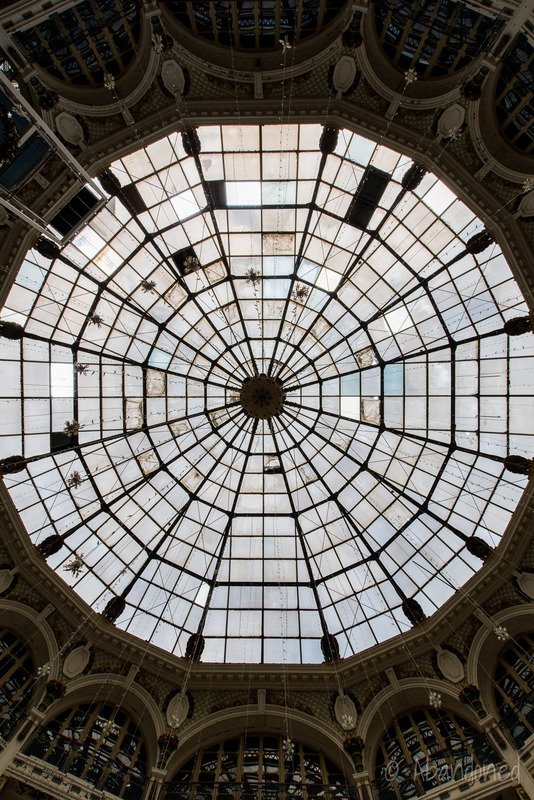 17 At the centre, Andrews planned for a glass-domed rotunda, 70-feet high and 90-feet in diameter. Market Building, 200-feet by 178-feet containing a 90-feet-wide by 70-feet-high rotunda, with passages out to Ludlow and Fourth streets. Third Street Arcade, which fronted Third Street and was built by M.J. Gibbons. 46 It featured a Flemish design and was reportedly patterned after a guild hall in Amsterdam, the Netherlands. Fourth Street Building, an apartment structure along Fourth Street designed in the Italian Renaissance Revival style. Kuhns Building, a commercial structure at the corner of Main and Fourth streets. A power building to generate steam heat and electric light. The Traxler Dry Goods Store building was erected in 1881 45 and was later connected to the Arcade. The building was destroyed in a massive flood of 1913 and rebuilt in the following year. 39 Traxler opted to relocate to seven floors of the new United Brethren Building in February 1924. 44 McCrory, a five-and-dime department store, opened in the former Traxler space on December 10. 43 The McCrory store layout was unusual as it had four entrances, via Main Street, Fourth Street, the rotunda, and the alley. By 1916, the Arcade Market House boasted 200 market stalls in the Market Building and more than 80 tenants elsewhere. 17 Most sold vegetables, fruits, and dairy products, but some sold typewriters, furnishings and even railroad tickets. Offices and apartments filled the upper floors. 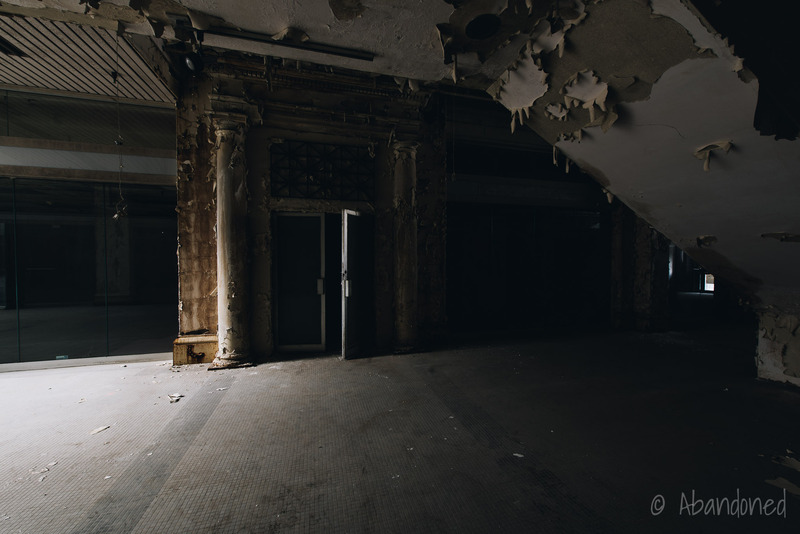 In 1974, 6 a group of investors, led by Bruce Bedford of the Mead Corporation and Albert Sealy, a partner in the law firm of Smith & Schnacke, proposed the renovation of the ailing Arcade. 7 While there were numerous restaurants and shops in the Arcade, there were a number of vacancies. Formal plans were announced for Arcade Square on May 4, 1976. 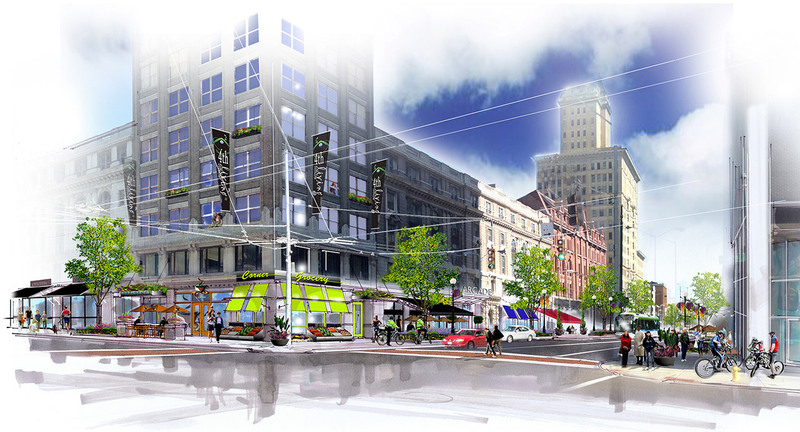 16 The proposal included a 90-car basement parking garage off of Fourth Street, the construction of another arcade to provide access from Main Street, and a 14-story apartment tower for the southwest corner of Third and Main streets. The Arcade Square project received more than $4 million in public works funds in June 1977. 16 Additionally, the investors were able to pull together the city’s major corporate entities—Mead, NCR, E.F. MacDonald and Dayton Newspapers, along with the city, to assist in the project by selling $2,500 limited-partnership “shares” in October. 16 Nearly $1.5 million was raised. The city then approved of $1.5 million in tax abatements for the development in March 1978. The project would entail the renovation of the rotunda and retail spaces for 114,000 square-feet of retail, restaurant and entertainment space 7 at the cost of $14.49 million. 6 Of that, Arcade Square pledged to raise $9.1 million, while the city pledged $315,000 in local funds. The investors also received $1.85 million in federal Economic Development Administration grant. The rehabilitation of the Arcade also spurred the renovation of the Dayton Inn and the post office. 6 Lorenz & Williams had proposed to renovate the old post office for its headquarters, while an investment group had planned to reopen the Dayton Inn as the Daytonian. 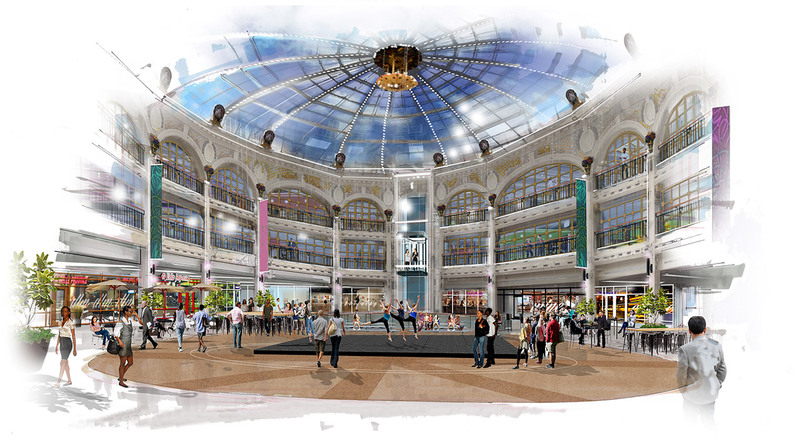 Arcade Square was scheduled to reopen to the public on November 15 7 but delays in work led a shift in its opening. 9 By December, the new elevators and escalators were installed, and the lights and glass had been outfitted in the rotunda. There was ongoing work with the plaster restoration and the installation of an automatic sprinkler system. By December, there were 33 stores and restaurants operating in the Arcade, 16 and even included a museum devoted to Coca-Cola, and fine art studios. 11 The Dayton Philharmonic, among other offerings, performed routinely in the rotunda. Source: Journal Herald [Dayton], 9 Oct. 1980, p. 2. Work began in 1980 to evict tenants from the Arcade Square apartments, which were unaffected by the renovations elsewhere in the complex. 10 Plans called for the 131 units to be converted to 45 efficiency, one-, and two-bedroom units, either as rentals or as condominiums. But the apartments were put on hold as Arcade Square generated a net loss of $1.6 million in 1981. 15 The partnership that owned the Arcade stopped making monthly mortgage payments because of the negative cash flow. Because of the poor cash flow, a public television station and disco operator pulled out of their lease agreements for space on the third floor in July 1981. 16 By November, about 57% of the space remained vacant. The original investors were asked to contribute another $1 million to prepare retail and office space for new tenants. In April 1982, the Arcade signed on Bell Publicom for 16,600 square-feet on the third floor and averted potential foreclosure by raising $1 million in new capital. Despite changes in the management and security company, the Arcade produced a net loss of $1.2 million in 1982. 15 In July 1983, Aetna Life & Casualty, one of the biggest loan underwriters for the Arcade Square renovation, moved towards foreclosure on the project over unpaid debts. 16 Bell Publicom closed their Arcade Square offices in March 1984 after the investors defaulted on loans from Huntington National Bank. Aetna Life, Gem Savings and Third National filed a court motion in June, seeking a $7 million against Arcade Square for unpaid interest and principal on mortgage loans. The city committed $9.5 million for Arcade Centre for acquiring land, relocating tenants and demolition. 17 Another $6 million was received via a federal Urban Development Action Grant. On February 24, 1987, the Webb Cos. presented plans for a revised 20-story office tower at Third and Main streets and a seven-story, 429-space parking garage at Third and Ludlow streets. 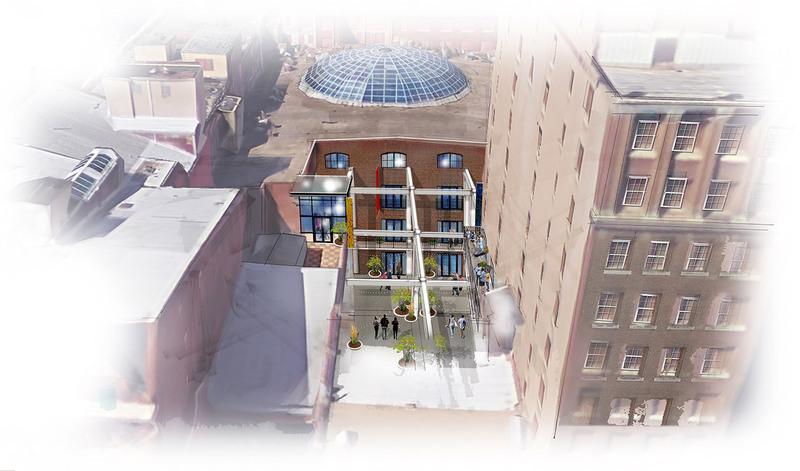 19 It would also include a two-story atrium wrapping around Arcade Square. The office tower was also revised to be faced with polished brown granite and pre-cast concrete with a granite face mix. The postmodern design, crafted by Charles E. Barnhart III, was unanimously approved by the Dayton Plan Board. At the time of its completion, it was just 30% leased. Under the development proposal from 1986, construction was to begin on the second tower, in the place of the Lindsay Building and the McCrory’s, when the first tower was nearly full and if the demand for more office space existed. But the city noted that because of the Arcade Centre’s slow leasing that another office tower may not be needed. It then noted that the Lindsay Building could be brought up to code for $116,000 and fully renovated by a developer for $2.3 million. The office mid-rise had been cleaned of asbestos in 1988 to prepare it for demolition, so the renovation costs were cheaper. 20 Additionally, the city stated that the McCrory, one of downtown’s busiest stores, could be given a facelift. The city spent $200,000 to reopen Arcade Square during the 1992 Christmas season. 26 “Holly-Days” featured pop-up shops and attractions. 27 During the 1992 Christmas season, an estimated 150,000 people visited the arcade. During “Holly-Days” event, the city began negotiations with Danis to take over Arcade Square. Danis wanted to sell a land-lease interest and nine buildings currently used for industry on 50 acres of land because new development was being hamstrung by nearby water wells. In return, Danis would transfer Arcade Square to the city if it acquired the land and buildings. The 1993 “Holly-Days” event saw sales fall 25%. 27 Because of the lack of interest, city funds directed towards “Holly-Days” was diverted to a children’s fair on Courthouse Square. Bob and Nancy Shiffler purchased the vacant Kuhn’s Building in 2002 and rehabilitated the building at the cost of $2.5 million. 39 The building was almost immediately fully leased, housing various marketing agencies, the Five Rivers MetroPark, and restaurants. McCrory’s filed for bankruptcy in 1992 and in February 1997, the downtown McCrory location closed. 40 42 The closure was part of a massive downsizing of the five-and-dime chain when it shuttered 300 of its last 460 stores. The Shiffler’s acquired the vacant McCrory Building in 2003 40 and rehabilitated the building at the cost of $2.5 million. 39 The renovation included the restoration of the removal of the steel facade and the restoration of the original granite facade of the building. A study completed by private consultants in June 2015 noted that any redevelopment should focus on a mix of 187 small- to medium-sized apartments, extended-stay business suites, and a boutique upscale hotel. 31 Demolition costs of the Arcade would vary between $8 million to $12 million depending upon which buildings would come down and which would be preserved. Any demolition could jeopardize the use of historic tax credits. 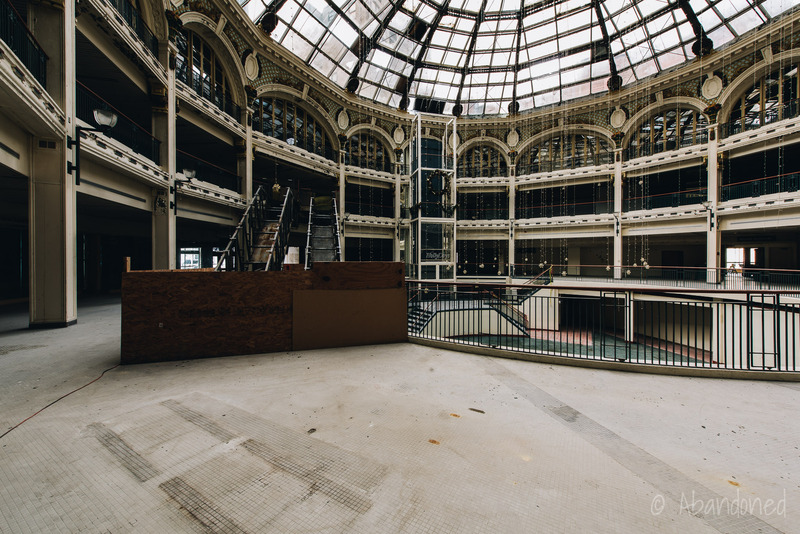 In September 2015, the city of Dayton authorized the spending of $700,000 on emergency repairs to the Arcade to buy time for redevelopment plans to take shape. 33 An out-of-state developer contributed $250,000 of the repair funds as a show of support for the property. Repairs byMiller-Valentine Commercial Construction included patching the roof, sealing windows, and cleaning and reattaching gutters. 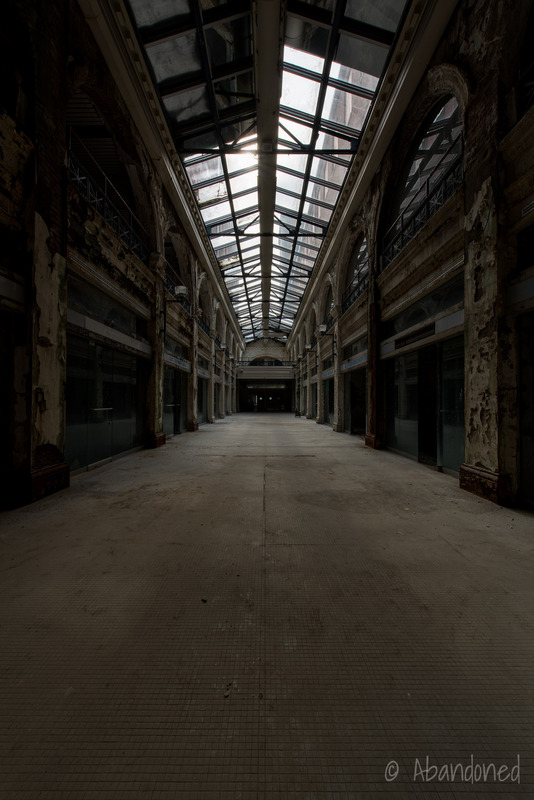 On January 28, 2016, the city announced a Memorandum of Understanding with the development team of the Dayton-based Miller-Valentine Group and Baltimore-based Cross Street Partners to redevelop the Arcade in a two-phased approach. The development team was able to purchase the Arcade property after Berg reached a deal with the county to transfer the property deed to the land bank in exchange for the elimination of his tax liability. 36 The land bank agreed to transfer ownership of the five Arcade properties to the new development team. 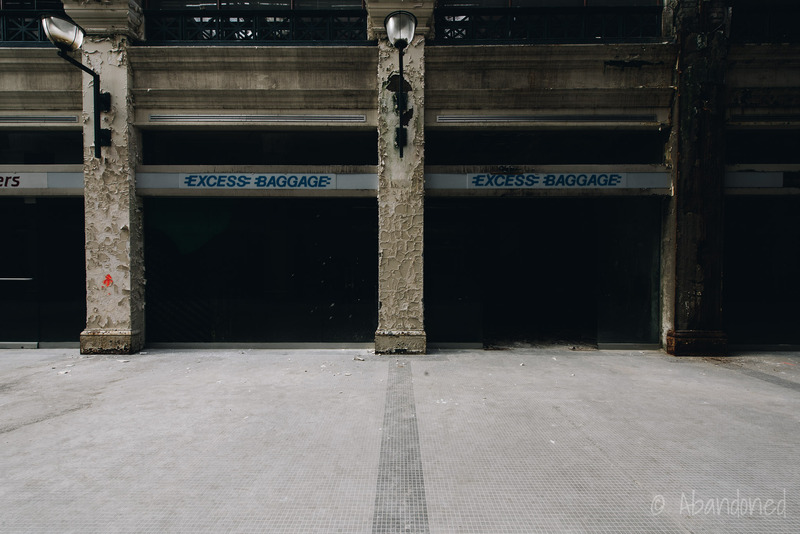 Phase two of the Arcade’s redevelopment would include the rehabilitation of the McCrory and Kuhns buildings, Gibbons Annex, and the Third Street arcade. 35 It would include 32 micro-apartments on the third through fifth floors spread between the Third Street arcade and Gibbons Annex. 4 35 The University of Dayton pledged to relocate its Entrepreneurial Center to the McCrory Building, occupying all three floors. Planned funding for the first phase project included the application for 9% competitive housing tax credits through the Ohio Housing Finance Agency and state and federal preservation tax credits. 1 It was estimated that the first phase alone could cost $56 million to $80 million. For the first phase, the developers were awarded $5 million in historic tax credits and $20 million in low-income housing credits. 2 34 Construction on phase one is set to begin early in 2018 and take 14 to 18 months to complete once all financing has been arranged. Frolik, Cornelius. 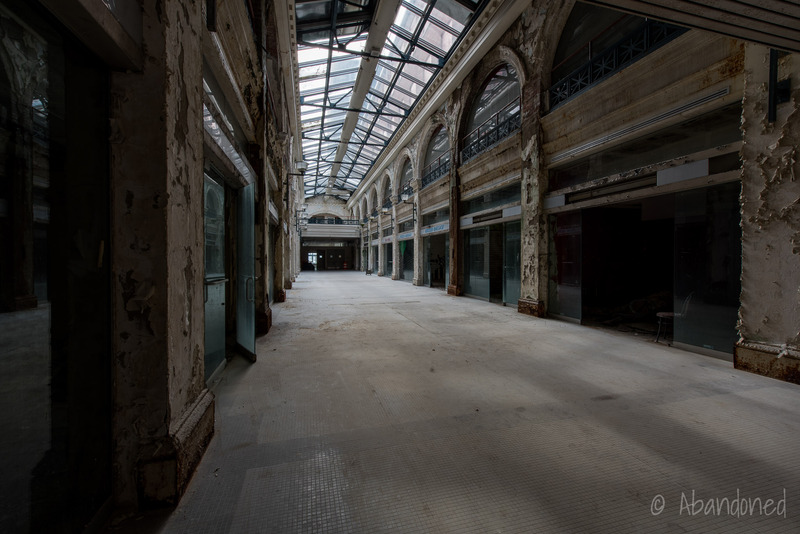 “Redevelopment of Arcade expected to take years.” Dayton Daily News, 28 Jan. 2016. Frolik, Cornelius. “Latest Dayton Arcade plans seek to blend past and future.” Dayton Daily News, 18 Nov. 2016. Frolik, Cornelius. “Living in the Dayton Arcade: What you need to know.” Dayton Daily News, 2 Aug. 2017. Frolik, Cornelius. “New Dayton Arcade plans: Pop-up restaurants, micro apartments, ‘secret’ tenant.” Dayton Daily News, 2 Aug. 2017. Smith, Joanne Huist. “Arcade rehabilitation set to begin.” Dayton Daily News, 7 Jul. 2009. Moore, Greg and Andrew Alexander. “Arcade plan winds $3 million grant.” Dayton Daily News, 4 Jan. 1979, pp. 1-5. Kintzel, Roger. “New Lease on Life.” Dayton Daily News, 22 Aug. 1979, p. 17. Morris, Burnis R. “Arcade dome may go unrestored.” Journal Herald [Dayton], 6 Jan. 1978, p. 3. “Spring Opening Planned for City’s Renovated Arcade.” Dayton Daily News, 9 Dec. 1979, p. 13A. Hills, Wes. “Flight to Inner City.” Dayton Daily News, 26 Oct. 1990, p. 1E. “A Grand Time.” Journal Herald [Dayton], 9 Oct. 1980, p. 2. Travis, Paul. “Downtown Arcade to open Saturday.” Dayton Daily News, 4 May 1980, p. 10A. Smith, Jay. “Options to Buy Arcade Key Parcels Acquired.” Dayton Daily News, 4 Nov. 1975, p. 17B. Hershey, William. “Arcade Named Historic Site.” Dayton Daily News, 28 Jun. 1975, p. 8. Seemuth, Mike. “Arcade lost $1.2 million in ’82.” Dayton Daily News, 22 Jul. 1983, p. 2. “A closer look at the past decade of Arcade development.” Dayton Daily News, 6 Apr. 1986, p. 10A. Kline, Benjamin. “Arcade’s shining hours brighten only memories.” Dayton Daily News, 6 Apr. 1986, pp. 1A-10A. Daley, Dave. “Some question Arcade plan.” Dayton Daily News, 6 Apr. 1986, pp. 1A-11A. Daley, Dave. “Arcade Centre plan wins OK.” Dayton Daily News, 25 Feb. 1987, pp. 1A-6A. Harty, Rosemary. “City scratches second Arcade tower.” Dayton Daily News, 30 Aug. 1989, p. 3A. McInnis, Doug. “Work begins on Arcade Centre project.” Dayton Daily News, 19 Jan. 1988, p. 3A. Dillon, Jim. “Prospective buyer looking at Arcade.” Dayton Daily News, 10 Nov. 1990, p. 6B. Stewart III, Mizell. “6 downtown eateries to move.” Dayton Daily News, 27 Feb. 1991, p. 3A. Stewart III, Mizell. “Downtown plans: From fanfare to failure.” Dayton Daily News, 23 Dec. 1990, p. 1A. Stewart III, Mizell. “Arcade tenants go next door as Danis deadline closes in.” Dayton Daily News, 1 Feb. 1991, p. 8B. Jasper, Debra. “City sees new plan for Arcade.” Dayton Daily News, 12 Nov. 1992, p. 1B. Jasper, Debra. “Spending less for Christmas.” Dayton Daily News, 15 Sept. 1994, p. 1B. DeBrosse, Jim. “Danis recedes, resettles.” Dayton Daily News, 8 Jun. 2003, pp. A1-A6. “Dayton needs an end game for Arcade.” Dayton Daily News, 13 Feb. 2005, p. B6. Smith, Joanne Huist. “Restoration isn’t new to buyer.” Dayton Daily News, 13 Mar. 2009, p. A4. Gnau, Thomas and Cornellus Frolik. “Study: Complex can be revived.” Dayton Daily News, 4 Jun. 2015, pp. A1-A8. Smith, Joanne Hulst. “‘Nuisance’ Arcade costing taxpayers.” Dayton Daily News, 21 Nov. 2012, pp. A1-A7. Frolik, Cornellus. 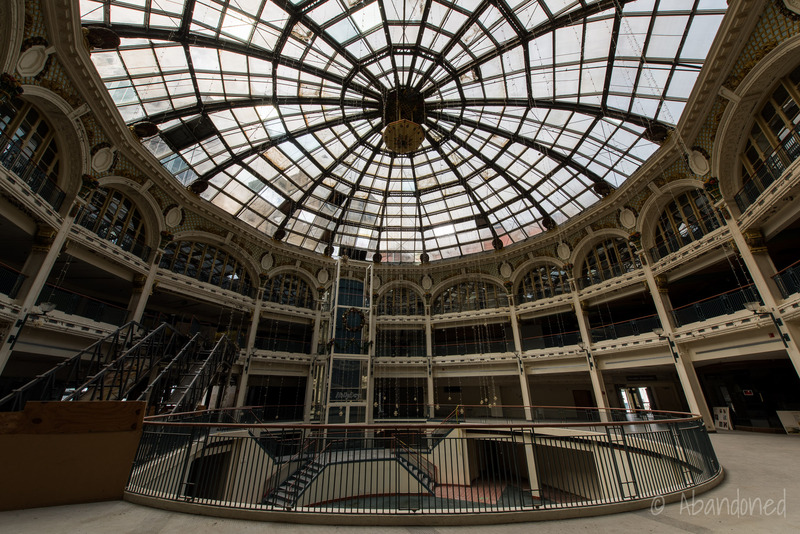 “City OKs repairs for Dayton Arcade.” Dayton Daily News, 24 Sept. 2015, pp. B1-B8. Powell, Lisa. “The Arcade: Dayton’s crowning jewel.” Dayton Daily News, 13 Jul. 2016, pp. SB1-SB2. Frolik, Cornelius. 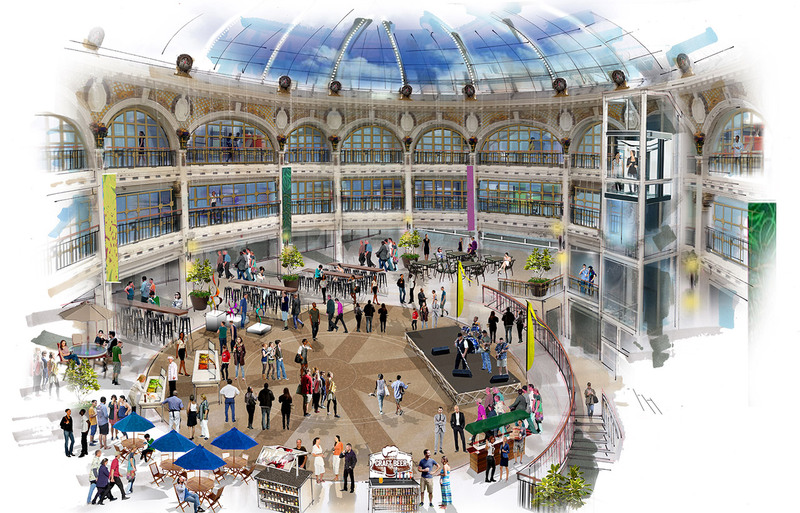 “Dayton Arcade now $5M closer to rebirth.” Dayton Daily News, 29 Jun. 2017, pp. A1-A6. Frolik, Cornelius. “Arcade’s $500K tax bill eliminated.” Dayton Daily News, 23 Sept. 2016, pp. A1-12. Gnau, Thomas and Cornelius Frolik. “Builders switch, but Dayton Arcade work to continue.” Dayton Daily News, 7 Mar. 2018, pp. A1-A7. Owen, Lorrie K. Dictionary of Ohio Historic Places. Vol. 2, St. Clair Shores, 1999. Stephens, Caleb. “Developers begin work on old ‘five and dime’.” Dayton Business Journal, 14 Jun. 2008. Smith, Joanne Huist. “Couple plan to restore building that housed McCrory’s store.” Dayton Daily News, 30 Oct. 2006, p. A4. Nichols, Jim. “Architecturally, thin was in, long ago.” Dayton Daily News, 21 May 2005, p. E9. “Liquidation sale at McCrory stores to begin by Friday at 285 sites.” Dayton Daily News, 28 Jan. 1997, p. 5B. Best Place to Purchase Your Holiday Gifts.” Dayton Daily News, 7 Dec. 1924, p. 10. “Traxler Store to Cut Stocks Down One-Half.” Dayton Herald, 22 Jan. 1924, p. 11. “The Traxler Dry Goods Store.” Dayton Metro Library. Article. “Mr. Gibbons’ Arcade Improvement.” Dayton Daily News, 11 Mar. 1902, p. 9. I’ve been in it-seemed kinda spooky to me. But definitely an experience.